December 1, 2010 — DECEMBER MEANS HOLIDAYS AND SUPPORTING YOUR FAVOURITE CHARITABLE ORGANIZATIONS! Show your support of your favourite charitable or not-for-profit group by visiting one of Ontario’s Charitable Gaming Centres today!! See Hall advertisements for more December 2010 events and promotions, including Seasonal Hours, Christmas Events and New Year’s Eve Party information!! ALSO IN THIS MONTH’S EDITION: BINGO PLAYER “TREASURE QUEST” CONTEST #50. THREE PRIZE LEVELS FOR DECEMBER 2010: Win [$100.] CA$H, or [1 of 2] $50. Bingo Gift Certificates, or [1 of 3] Bingo Toastie Comforters [retail value approx. $25], courtesy of G-E Consulting. *** 6 PEOPLE WILL WIN PRIZES! REMEMBER: Our JANUARY 2011 issue is due in Halls on THURSDAY, DECEMBER 23, 2010 — where you’ll find much more extensive “New Year’s Eve” event details! Please, if you can, remember to make donations to in-Hall Food Drive & Toy Drive activities. You’ll bring a little “Peace on Earth” to someone you don’t even know. THANK YOU!!!! CLICK HERE TO SEE NEW “CHRISTMAS” & BINGO-THEMED ACCESSORIES from our new advertiser, BAZAAR MARKETING. Available directly to the public, or at participating Ontario Bingo Halls near you! CLICK HERE TO SEE NEW “CHRISTMAS” GOODIES – INCLUDING THE NEW “BINGO TOASTIES“ from G-E CONSULTING. Available from G-E Consulting direct (open to the public), or at a participating Ontario Bingo Hall near you! November 1, 2010 — REMEMBER IN NOVEMBER — FUND-RAISING EFFORTS IN FULL SWING AT ONTARIO BINGO HALLS! Show your support of your favourite charitable or not-for-profit group by visiting one of Ontario’s Charitable Gaming Centres today!! See Hall advertisements for more November 2010 events and promotions!! We’re also celebrating our 8th ANNIVERSARY AT BINGO PLAYER MAGAZINE! Thank you to everyone who makes our magazine the “Best Bingo Magazine On Earth”! ALSO IN THIS MONTH’S EDITION: BINGO PLAYER “TREASURE QUEST” CONTEST #49. THREE PRIZE LEVELS FOR NOVEMBER 2010: Win [$100.] CA$H, or [1 of 2] $50. Bingo Gift Certificates, or [1 of 3] Bingo Dabber 12 Piece Gift Bags [retail value approx. $25], courtesy of Arrow Games, Ink Division, Canada. *** 6 PEOPLE WILL WIN PRIZES! CLICK HERE TO SEE NEW “CHRISTMAS” & “NEW YEARS” BINGO INK DABBERS from ARROW GAMES CANADA. Available at participating Canadian & Ontario Bingo Halls near you! October 1, 2010 — FUND-RAISING EFFORTS AT BINGO ALL THROUGH OCTOBER! Show your support of your favourite charitable or not-for-profit group by visiting one of Ontario’s Charitable Gaming Centres today!! See Hall advertisements for more Thanksgiving (Monday, October 11), Hallowe’en (Sunday, October 31) and other October 2010 events and promotions!! WE HAVE A NEW ADVERTISER FOR A LIMITED TIME! If your Bingo Hall is looking for Bingo Bags, Bingo Cushions, Bingo T-Shirts and more, please give GE-CONSULTING A CALL! Great ideas for BINGO HALL V.I.P. PROGRAMS! CLICK HERE TO SEE NEW “CORONATION STREET”, “CHRISTMAS” & “NEW YEARS” BINGO INK DABBERS from ARROW GAMES CANADA. Available at participating Canadian & Ontario Bingo Halls near you! September 1, 2010 — FUND-RAISING GETS BACK TO WORK AFTER A HEAT-FILLED SUMMER! And we appreciate their ongoing support in our magazine. Show your support of your favourite charitable or not-for-profit group by visiting one of Ontario’s Charitable Gaming Centres today!! See Hall advertisements for more Labour Day (Monday, September 6) and other September 2010 events and promotions!! ALSO IN THIS MONTH’S EDITION: BINGO PLAYER “TREASURE QUEST” CONTEST #47. THREE PRIZE LEVELS FOR SEPTEMBER 2010: Win [$100.] CA$H, or [1 of 2] $50. Bingo Gift Certificates, or [1 of 3] Bingo Dabber 12 Piece Gift Bags [retail value approx. $25], courtesy of Arrow Games, Ink Division, Canada. *** 6 PEOPLE WILL WIN PRIZES! CLICK HERE TO SEE NEW “THANKSGIVING” & “HALLOWE’EN” BINGO INK DABBERS from ARROW GAMES CANADA. Available at participating Canadian & Ontario Bingo Halls near you! August 1, 2010 — GROUPS WHO RELY ON BINGO FOR FUND-RAISING APPRECIATE YOUR VISITS! And we appreciate their ongoing support in our magazine. Show your support of your favourite charitable or not-for-profit group by visiting one of Ontario’s Charitable Gaming Centres today!! See Hall advertisements for more Simcoe Day (August 2nd) and August 2010 events and promotions!! ALSO IN THIS MONTH’S EDITION: BINGO PLAYER “TREASURE QUEST” CONTEST #46. THREE PRIZE LEVELS FOR AUGUST 2010: Win [$100.] CA$H, or [1 of 2] $50. Bingo Gift Certificates, or [1 of 3] Bingo Dabber 12 Piece Gift Bags [retail value approx. $25], courtesy of Arrow Games, Ink Division, Canada. *** 6 PEOPLE WILL WIN PRIZES! July 1, 2010 — CANADIANS ARE GENEROUS PEOPLE! This may not be news, but when it comes down to it, we DO love to support our favourite charitable or non-profit groups. THAT’S WHAT BINGO IS ALL ABOUT! Hundreds, if not thousands of Ontario charitable and not-for-profit groups rely on funds raised when you play Bingo. For some people, who like games of chance, they even find playing Bingo much better than scratching off lottery tickets or going to a casino. That’s because Bingo Halls are vibrant communities of people who look forward to seeing you – not just your money! Visit one of our advertisers and you’ll find this to be true!!! See Hall advertisements for more Canada Day and July 2010 events and promotions!! ALSO IN THIS MONTH’S EDITION: BINGO PLAYER “TREASURE QUEST“ CONTEST #45. THREE PRIZE LEVELS FOR JULY 2010: Win [$100.] CA$H, or [1 of 2] $50. Bingo Gift Certificates, or [1 of 3] Bingo Dabber 12 Piece Gift Bags [retail value approx. $25], courtesy of Arrow Games, Ink Division, Canada. *** 6 PEOPLE WILL WIN PRIZES! CLICK HERE TO SEE NEW “CANADA DAY 2010” BINGO INK DABBERS from ARROW GAMES CANADA. Available at participating Canadian & Ontario Bingo Halls near you! June 21, 2010 — JACKPOT – THE MOVIE! 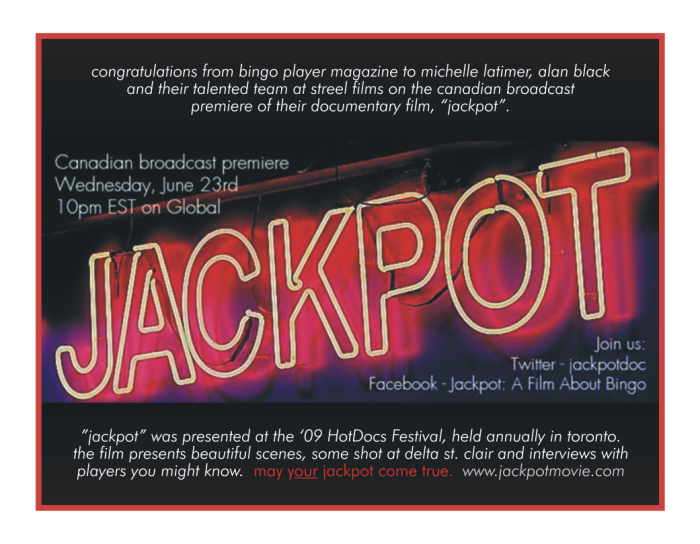 “JACKPOT”, a documentary about Bingo and Bingo Players and featured at Toronto’s HotDocs Festival ’09, will make it’s Canadian television premiere on Global TV. Filmed on location at Delta Bingo St. Clair. Congratulations to Michelle, Alan & the Streel Films team. June 1, 2010 — GET OUT OF THE HEAT AND INTO A COOL LOCAL BINGO HALL TODAY! Welcome to our new advertisers – DELTA UNCLE SAM’S BINGO CENTRE FORT ERIE and DELTA BINGO CENTRE ST. CATHARINES & ALL OF THEIR SPONSORS! PLUS, FIND INFORMATION ABOUT PACIFIC GAMING ELECTRONIC BINGO PRODUCTS AND THE NINE HALLS THAT FEATURE THEIR EQUIPMENT! See Hall advertisements for more Father’s Day and June 2010 events and promotions!! ALSO IN THIS MONTH’S EDITION: BINGO PLAYER “TREASURE QUEST“ CONTEST #44. THREE PRIZE LEVELS FOR JUNE 2010: Win [$100.] CA$H, or [1 of 2] $50. Bingo Gift Certificates, or [1 of 3] Bingo Dabber 12 Piece Gift Bags [retail value approx. $25], courtesy of Arrow Games, Ink Division, Canada. *** 6 PEOPLE WILL WIN PRIZES! CLICK HERE TO SEE NEW “FATHER’S DAY” BINGO INK DABBERS from ARROW GAMES CANADA. Available at participating Canadian & Ontario Bingo Halls near you! May 24, 2010 — KENNEDY BINGO BEGINS THEIR “RADIO BINGO” GAMES! Get your card at Kennedy Bingo and listen to AM740 for the next ball to be called. Win up to $500. CLICK HERE FOR MORE INFORMATION. May 1, 2010 — MOM LOVES BINGO! Welcome back to BINGO WORLD RICHMOND HILL, DELTA BINGO CENTRE HAMILTON & ALL OF THEIR SPONSORS!! See Hall advertisements for more Mother’s Day, Victoria Day May 2-4 Monday and more May 2010 events and promotions!! Delta News: Staff Spotlight. CLICK HERE to learn more. ALSO IN THIS MONTH’S EDITION: BINGO PLAYER “TREASURE QUEST“ CONTEST #43. THREE PRIZE LEVELS FOR JUNE 2010: Win [$100.] CA$H, or [1 of 2] $50. Bingo Gift Certificates, or [1 of 3] Bingo Dabber 12 Piece Gift Bags [retail value approx. $25], courtesy of Arrow Games, Ink Division, Canada. *** 6 PEOPLE WILL WIN PRIZES! CLICK HERE TO SEE NEW “FATHER’S DAY” & “CANADA DAY 2010” BINGO INK DABBERS from ARROW GAMES CANADA. Available at participating Canadian & Ontario Bingo Halls near you! SPECIAL $100,000.00 BINGO GAME ON THE FIRST OF EVERY MONTH. April 1, 2010 — NO JOKING – BINGO NEEDS YOUR SUPPORT! See Hall advertisements for more Easter Weekend and other April 2010 events and promotions!! ALSO IN THIS MONTH’S EDITION: BINGO PLAYER “TREASURE QUEST“ CONTEST #42. THREE PRIZE LEVELS FOR APRIL 2010: Win [$100.] CA$H, or [1 of 2] $50. Bingo Gift Certificates, or [1 of 3] Bingo Dabber 12 Piece Gift Bags [retail value approx. $25], courtesy of Arrow Games, Ink Division, Canada. *** 6 PEOPLE WILL WIN PRIZES! CLICK HERE TO SEE NEW “MOTHER’S DAY” & “PINK PANTHER” BINGO INK DABBERS from ARROW GAMES CANADA. Available at participating Canadian & Ontario Bingo Halls near you! 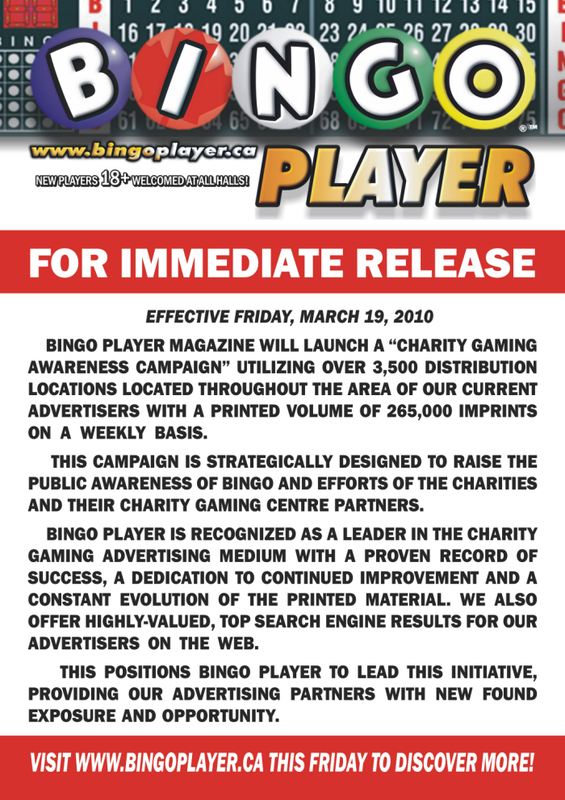 March 19, 2010 — BINGO PLAYER MAGAZINE LAUNCHES REGIONAL “BINGO AWARENESS” CAMPAIGN! March 1, 2010 — Remembering one of Bingo’s finest volunteers – Delta Mississauga’s BILLY MARTIN. CLICK HERE to learn more. ALSO IN THIS MONTH’S EDITION: BINGO PLAYER “TREASURE QUEST“ CONTEST #41. THREE PRIZE LEVELS FOR MARCH 2010: Win [$100.] CA$H, or [1 of 2] $50. Bingo Gift Certificates, or [1 of 3] Bingo Dabber 12 Piece Gift Bags [retail value approx. $25], courtesy of Arrow Games, Ink Division, Canada. *** 6 PEOPLE WILL WIN PRIZES! CLICK HERE TO SEE NEW “EASTER” & “PINK PANTHER” BINGO INK DABBERS from ARROW GAMES CANADA. Do you call them daubers? Or ink markers? Available at participating Canadian & Ontario Bingo Halls near you! February 1, 2010 — FALL IN LOVE WITH BINGO! If you really want to make a positive impression on a loved one this Valentine’s Day — take them to Bingo! You can show you have a sense of community, support charitable and not-for-profit activities in your neighbourhood and still like to have the chance to win something amazing!! See Hall advertisements for more Valentine’s Day, Family Day and other February 2010 details and event promotions!! “REV UP THE FUN” CAR WINNERS PICTURES!! Click the car image below to see more December 19, 2009 Winners at some of the participating Ontario Bingo Halls! ALSO IN THIS MONTH’S EDITION: BINGO PLAYER “TREASURE QUEST“ CONTEST #40. THREE PRIZE LEVELS FOR FEBRUARY 2010: Win [$100.] CA$H, or [1 of 2] $50. Bingo Gift Certificates, or [1 of 3] Bingo Dabber 12 Piece Gift Bags [retail value approx. $25], courtesy of Arrow Games, Ink Division, Canada. *** 6 PEOPLE WILL WIN PRIZES! CLICK HERE TO SEE NEW “VALENTINE’S DAY” & “ST. PATRICK’S DAY” INK DABBERS from ARROW GAMES CANADA. Available at participating Canadian & Ontario Bingo Halls near you! January 16, 2010 — INTERNATIONAL CENTRE BINGO CLOSES AFTER THIRTY-EIGHT YEARS. Click here to read the full story. January 1, 2010 — * HAPPY NEW YEAR! If you have some spare time over the Holidays, why not take in a fun game of Bingo!! OLYMPIC TORCH BEARER RUNS FOR BINGO AT INTERNATIONAL CENTRE!! Meet TANYA HOUSE!!! CLICK HERE TO READ HER STORY (Part 3 of 3). “REV UP THE FUN” CAR WINNERS PICTURES!! Click the car image below to see December 19, 2009 Winners at some of the participating Ontario Bingo Halls! ALSO IN THIS MONTH’S EDITION: BINGO PLAYER “TREASURE QUEST“ CONTEST #39. THREE PRIZE LEVELS FOR JANUARY 2010: Win [$200.] CA$H, or [1 of 2] $100. Bingo Gift Certificates, or [1 of 3] Bingo Dabber 12 Piece Gift Bags [retail value approx. $25], courtesy of Arrow Games, Ink Division, Canada. *** 6 PEOPLE WILL WIN PRIZES! CLICK HERE TO SEE “NEW YEAR’S” & NEW “VALENTINE’S DAY” INK DABBERS from ARROW GAMES CANADA. Available at participating Canadian & Ontario Bingo Halls near you!